As some readers will know, I was on blogcation last week, visiting my parents. There was much to be thankful for in the time I visited, and much that was difficult. I am still processing the experience, and find my reflections are not yet ready to post. I do, however, have an earlier story that provides some context for what will follow. This piece was originally written for performance at Cheap Theatre at the Black Forest in May 2013. It is not a slam story, and therefore is longer than a typical blog post. I am grateful to Cheap Theatre’s Artistic Director Erica Christ for providing a venue in the Twin Cities where longer, more complex material can be attempted. The game-changer for my parents came in October of 2011. At least that is the moment I focus on. “I need to sit down,” my mother announced, and she did, on the picture window ledge, next to her Christmas cactus. My father straightened up – it takes a while these days – and when he looked at my mom, she was slumped over unconscious. He couldn’t wake her up. I learned this all on the phone, after it happened. My parents live in a tiny little town in New York State, over a thousand miles away from where I live in Minneapolis. In my mind’s eye I see my father’s hand, its knuckles knobby from arthritis, age spots mottling the skin, reaching for the phone receiver, the one with the cord so long it would travel all over the house. I see his index finger shaking as he dials 9-1-1. Of course that phone is gone now – they have a cordless – and nobody “dials” anything. But the picture is as vivid as if I’d been there. A fire truck came first – they must have been the closest paramedics – and then an ambulance. Lots of flashing lights, my mother said. By that time she had regained consciousness. She had no memory of the last twenty minutes, and could not figure out what the fuss was about. At the hospital, they did a battery of tests but found nothing. “Could have been a drop in potassium,” the doctor said. “These things happen.” Still, they made her stay overnight. Over the phone I ask her how she is feeling. “I’m fine,” she says. “Isn’t that exasperating?” Mainly she seems annoyed. “Your mother’s tough,” says my father. But I’m not convinced he believes it. The hierarchy I observed in my parents’ marriage was both personal and professional. My mother was an elementary school teacher, and my father was a principal. At different schools, thank God. My father was the official breadwinner; my mother worked, we were told, to send us all to college. She would come home an hour or so before he did, and talk to us kids about our day over oreos and milk. Then, if what was supposed to be thawed was somehow not thawed – before microwaves, this was a problem – there was the inevitable question, “Now what should I make your father for dinner?” “Macaroni and cheese!” we’d scream, but though we saw that as a main course, my father most certainly did not. Macaroni and cheese was a side dish for something with bones in it. Whatever she decided, the thing with bones had to be in the oven before he got home at 5:30. Dinner was promptly at six. You didn’t want to deal with my dad if dinner was late. In the meantime, there’d be wine and snacks in the living room while my father told her about his day. Flowers grow there though. 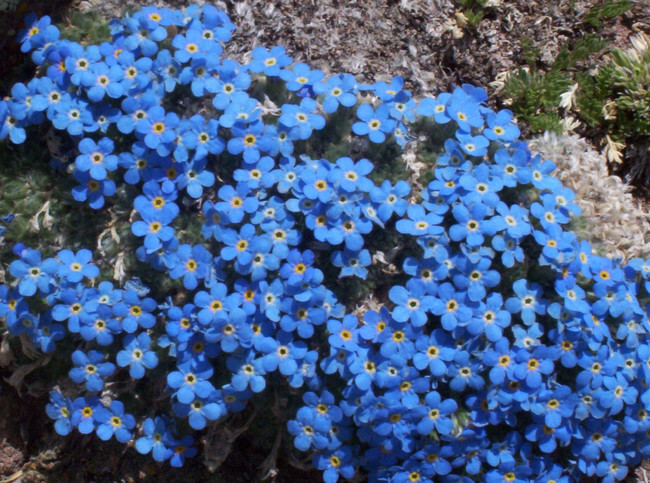 These are Alpine Forget-Me-Nots. Courtesy The Delgados. I saw beneath that hierarchy once. In 1976, my sophomore year in college, I came home for spring break. My mother had just had a “routine” hysterectomy. The issue was fibroids. She was 43. My father had said he was not himself, that he was taking medication, but I didn’t really know what that meant. I had seen my grandmother depressed; she cried a lot. My dad just seemed slow, and not altogether there. He’d had a physical recently; they were ruling things out. But it was my mom who was in the hospital. I used to pray that if one of my parents had to die first, it would be my father. Not because I wished him ill. Mainly because I couldn’t imagine how he’d manage without her. And also, I have to admit, because I wondered who she might be without him. 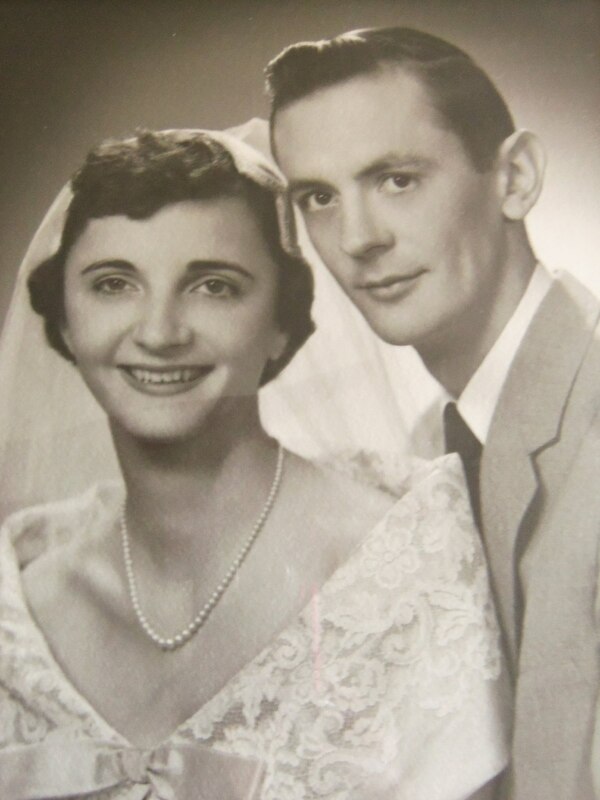 It is hard to find pictures of my mother alone after she’s married. 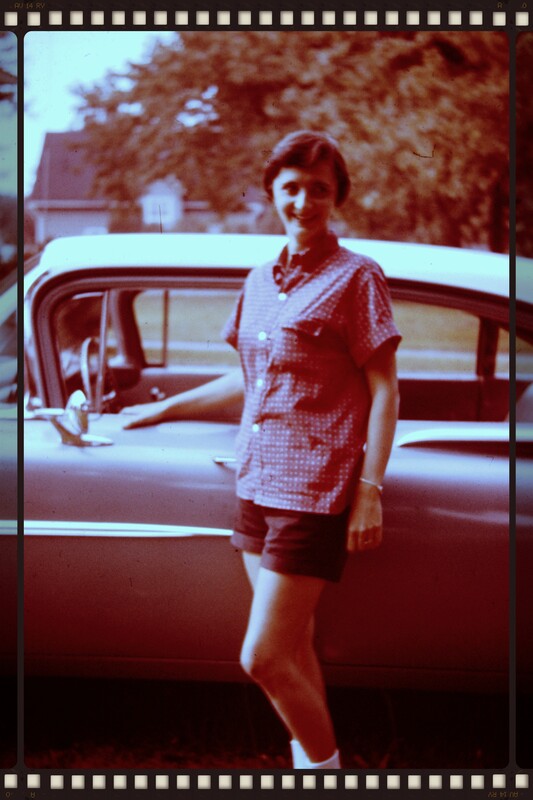 This one was taken in 1961 at her parents’ house on Schaal Ave. in Erie, PA. She was 29, and the mother of two. Was the car new? “Everyone does that,” I say. It was May 2012. My sister had organized a surprise party for my mother’s 80th birthday. Cousins I had not seen since my grandmother’s funeral twelve years before showed up. Both my mother’s younger sisters died of cancer within a year of each other. My mother looked – and sounded – more like their mothers than anyone else alive. What I think is that someone from Mission Impossible has made a mask of my mother’s face, and put it over her real one, and they haven’t gotten it quite right. It’s too pale, and too vague, and far too distant. She can laugh through it, and cry through it, and sometimes it seems quite natural. I watch how she interacts with each person, how she brightens when the connection is clear, and dims when it is not. And how hard she works to keep everyone from knowing the difference, until late in the day, after my youngest cousin says goodbye, and something finally gives. “I’ve never seen that man in my life,” she says. “Don’t shout at me,” she says. She looks embarrassed. “I must have had too much wine.” But the mask goes up, and I know that’s not what it is. 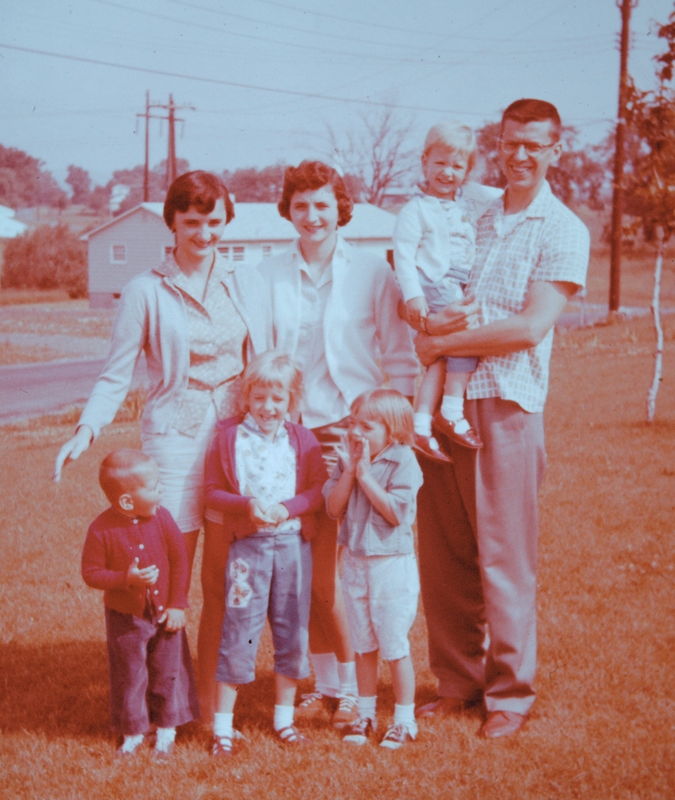 Above: My mom, her sister Alice, my Uncle Fred and cousin Suzanne. Below: My brother Scott, my cousin Cindy, me (trying to amplify my voice before social media). Behind the camera: My dad. After this I start noticing things, even on the phone, even a thousand miles away. How often names disappear. How often words go missing, or get jumbled up with other words. “I must be tired tonight,” she says. There’s one word she won’t say, and doesn’t want to hear, even after the diagnosis. “I’ve been there,” she says. “I know what that means.” It was my mother who had power of attorney for my grandmother after her two younger sisters died, who visited her in the Memory Care Unit, who saw each step of the disintegration ahead. “Forgotten is forgiven,” says F. Scott Fitzgerald. All my life the point of telling stories has been to remember and forgive. Now it seems we must learn to do both. It’s the summer before my mother’s collapse, before she’s forgotten Stephen, before she’s writing her own obituary. I am sitting at the picnic table on the screened-in porch with my parents, eating corn on the cob. A plate full of fresh ears have just come out of the pot, and on my father’s plate two are already cleaned. My mother has finished an ear, delicately, with so little butter on it you would not know it was there. She is working on her cottage cheese and pineapple, but it’s slow going, because she has to keep getting up and down to check on the next six ears. “On the farm,” my dad says, “we’d have whole meals that were nothin’ but corn and biscuits, snap beans and tomatoes. ” Apparently meatless meals were OK at harvest time. That made sense. The more the family ate, the less you had to can. My mother is not a farm wife. She brings out a plate of Pillsbury Grands. Even into his eighties, my father is a corn-eating machine. He goes row by row methodically, confident in his lower bridge. He does not bother with the handles shaped like little ears of corn, the ones we adored when we were children, the ones that sent a cannibalistic shiver of poetic justice down our own plastic spines as we stabbed them into the center of the soft cob. 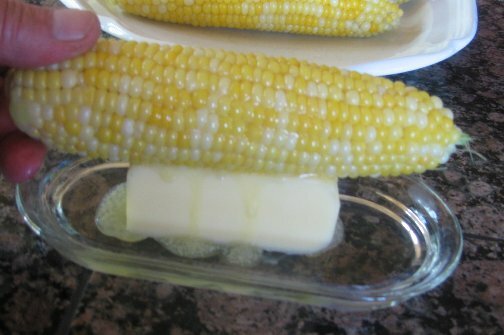 My mother would suffer in silence as we children buttered our corn the way my father taught us, farmer-style, turning the hot ears atop the gradually deforming stick of butter. She was an urban creature. Butter was a rectangle for a reason; it should disappear gradually in slivers, so that you barely noticed its diminishment. But “rolling the corn is half the fun!” my father would say. And we agreed. After the meal, she would hide the mess that remained in the back of the refrigerator, and put a fresh stick in the butter dish, one that did not display the marks of appetite, the indignity of meltdown. She let us do it. But under protest. These days there is not enough food in the refrigerator to hide a deformed stick of butter behind. Mostly they eat Lean Cuisine. But the corn is in at the Farmer’s Market, and this is a special occasion. The prodigal daughter has come home. My father’s chin is greasy and there are little skins of corn kernels that escape his methodical attack and end up at the corners of his mouth, and on his chin as well. When he is finished with his ear he will wipe them off, but it is inefficient to do so each time one appears, and I’m not sure he is aware of them anyway. As he eats his own ears move back and forth, up and down, with the motion of his jaw. Their cartilage has grown and cauliflowered: what is the purpose of this? What evolutionary advantage could it possibly serve? After everyone is in bed I take out my laptop and hold it heavenward in the living room, searching for our neighbor’s wi-fi. I find a spot near the window and type my question into Google Search: Why do our ears keep growing? The basic answer appears to be gravity. They don’t get wider, as it turns out, just longer. Our ears are growing toward the ground. I go to bed and dream, my own ear to the pillow, listening. I dream that my father is eating the years; the niblet days line up in rows and he mows them down, his teeth the harvesting scythe, then tosses each onto the plate for my mother to carry away. His munching, moving ears grow down and down, till they are too heavy, and slip off his head altogether. They hook onto his shoulder blades, and still they keep growing. When they reach the ground he must decide: Should they grow bark, or sprout feathers? Does he want roots, or wings? He turns to ask my mother what to do, but she is birling down the River Styx, or Lethe – can anyone tell them apart? Her feet are dancing on corncobs; she cannot answer, nor could he hear her if she did. Such an honest recollection of your parent’s strengths and eventual decline – so brave of you and so well written. Congrats. Thanks, Jan. I don’t know that it’s particularly brave of me. But I appreciate the support. It is so sad to see the decline of one’s parents. As we grow up they seem so strong and invincible, the holders of wisdom and strength. As we get older we realise that vulnerability is something they, like we, tuck away hoping for the ability to make the right decisions through each day. Then they age, and we become the owners of the strength and must make decisions for them that they can no longer make for themselves. It saddens us, not only for the loss of their essence, but the inevitability of it for us all. Alzheimer’s is a very cruel disease. I wish you courage and strength, acceptance and peace as you support your parents, your family and yourself through this next chapter of your life. Thank you, Norah. You are right on so many counts. And I’ll gladly accept all the courage and strength that is sent in my direction, although in truth my youngest sister now has the bulk of the responsibility. One of the more jarring things about my visit last week was that I had hoped to be able to seamlessly step into her shoes while she was out of town, and this was a lot more difficult than I had anticipated. Oh Paula, my dear, I think this is the most beautiful peace you’ve written (at least, the most beautiful of yours I’ve read, so far) It’s so moving! I smiled (a lot) as I read, and I cried. You paint such a vivid picture of your family, your parents especially…. their vulnerabilities, their strengths, their fear (though often masked) , and their quirks….it all shines through poignantly in this beautifully written piece. ( “Now what should I make your father for dinner?” “Macaroni and cheese!” we’d scream, but though we saw that as a main course, my father most certainly did not. Macaroni and cheese was a side dish for something with bones in it. I,m so sad for you (for you all) but especially for you, because you're my friend, and as such, I hate that you're hurting, but I did enjoy reading this piece, because it made me smile (in places) because it filled me in on where you're at, how you're feeling, and how you're coping, (in a way that's just not possible in 140 charachters)….and because it is so full of love! Thank you Kimmie. Your support means a lot to me, especially knowing what you’re dealing with with your own dad right now. I’m glad you liked the flashback. My dad could really be a fee-fi-fo-fum kind of guy. I so agree, Paula, this is a beautifully written with a poignant mixture of humour, sadness and frustration. I also think it’s wise of view, with your parents on your mind after your visit, but with the impression is not yet processed, to share something about them but less recent. Hope you are managing to get back into your own life! Thank you Anne. For me writing is a process of discernment, as we have talked about before: I have a lot of notes, but they’re still very raw. Meanwhile, my own life has come back with a vengeance. Fortunately the taxes are now done. But there’s a storytelling festival on Friday for which I have to re-learn a folktale, and about eleventy-two proposals due this month. I am grateful to my parents for reminding me to be still amid the sturm und drang. Beautiful, as always. I’m afraid I haven’t much else to say but to tell you you are not alone. *hugs* Thanks so much for sharing! I appreciate the reminder, Amalie. This is a subject that touches so many of us, and yet it can feel so isolating. Hugs back. Wow, amazing, Paula. My family has much Alzheimer’s its DNA, and I fear it more than almost anything. This is a really lovely, honest look at it. I’ve just started down this very same road. Thanks for giving voice to what I’ve been feeling. Give yourself permission to scream into your pillow, too, Anita. It helps, a little. So does scotch. Seeing our parents’ decline is so difficult. This post is heartbreaking, but it’s a heartbreak that so many of us experience nowadays. I visited my mother this past week and noticed so much that is “aging” in her appearance and in her memory and her body, so much that is difficult for both her and me to accept. But I am ever grateful for the lucid moments when she remembers and when she still sees me as me, the moments when we still can laugh and remember together. Thanks for this post, Paula. You have a gift for capturing the moments that define us. Thank you Shannon. I appreciate your empathy and your reminder about gratitude. And while i have that gift, I intend to use it. Been dealing with Alzheimer’s Mom syndrome for 6 years now. This is such a good piece, Paula. My mum is 89 and I’m always thinking, one day I will get the call to say she is no longer with us. And that will be that. Ooo… we wonder who Alan was, don’t we? Thank you for the compliment on the piece, and I’m sorry to be so late in replying. April is a busy grant month, and then last weekend was StoryFest. I’ve never before had comment debt on a post still pending before publishing the next one! My mother moves in and out of knowing us; I just finished “Elizabeth is Missing” by Emma Healy, on Anne Goodwin’s recommendation, and there was a lot of accuracy in that portrayal of sometimes knowing, sometimes not. She knows that I’m not my sister Whitney, and that I’m not my sister Stacey, but I get called by both names, and on my last visit I had to accept the fact that I probably won’t be hearing my own name from her lips without prompting again. She hasn’t yet called me by either of her deceased sister’s names, but I can see that coming. There were some heartbreaking moments on the trip, and some beautiful ones too. I guess that’s just life. Hot tea with honey and lemon, stat. We lost our mom to Alzheimer’s late last year after a ten year battle. She got a terrible case of Shingles and was never the same. My sister Patty had Mom live with her, because Mom woke up so afraid most of the time. She didn’t know who or where she was, even though, most of the time, she recognized us. It’s a horrible disease. I wish you and your family the best. Yes, there’s often another illness involved. Singles can be sheer torture. What happened to my mother in 2011 was probably related to her blood pressure medication and her pacemaker; she’s had a couple of similar bouts recently, and after they made some changes those stopped. But there’s also been a bout with pneumonia each year for the last two years, and every time she goes into the hospital, she’s more disoriented after recovery. I’m told that is common. Thanks for the good thoughts, Judith. I love this piece, especially the last image, but also the mask. But I can’t leave out the corn. My grandmother and all her children, including my mom, died of Alzheimer’s and old age. You make me care so much about your parents. Good writing. Beautiful and heartbreaking. Love this post, Paula. Thank you, Sarah. Wrestling beauty out of pain is one of the things we’re here for, I guess, so I keep trying. Wrestling beauty out of pain. That is a gorgeous way to put it. So true. A beautiful, poignant and thoughtful post! It’s clearly from the heart. Mentally Me said it: “You paint such a vivid picture of your family, your parents… “ I loved the post. I wish you strength and peace as you journey through this next chapter of your life. Those wishes are greatly appreciated, Kate. Sorry it has taken me so long to say so. As a young reader, I was especially moved by this, touching, happily nostalgic and sad in turns. It’s hard to accept the fact that the roles reverse soon, and you need to support your parents instead. All I can do is wish you the strength you need to face life’s inevitable. That is more than enough, Snigdha. Thank you for stopping by. And keep making fun of math. When i was your age, i wrote some of my best poetry in math class. What a kind input you offered there, Snigda Ramkumar. May you be showered with lots of blessings and you too pal for sharing your story. Kindly explore my previous scribbles. Thanks for stopping by, James. Paula you have captured so poignantly what you are going through, I so feel for you and your family. A close friend of mine is going through the same thing at the moment and has recently had to put her mum in a home and it is breaking her heart, her father has lost hope and as it was said earlier suddenly you become the carer when for so many years you look at your parents as the strong wise ones that you go to when you need some advice or just acceptance. My parents are 92 and 85 and I am six hours away from them so experience similar feelings as my sister is only two hours away therefore a lot of the responsibility does fall on her but each time I am with them I see that they are loosing their independence and strength to do the things they really want to do, my father gets frustrated because he can’t do things that were second nature to him for the best part of his life. Old age can be sad, but I am so grateful that my parents have got to this age with relative ease when so many do not have the blessing of seeing their parents reach old age. Keep strong. Thank you. I must have missed this comment somehow in the flurry of response to the post; my apologies. I certainly get advice when I am home. Acceptance is another matter. One of my dad’s mission’s in life seems to be to make sure we can all take “a little criticism.” I’m glad your experience has been one of consistent support. Thanks Paula, I noticed you had a lot of comments on your post it was obviously an experience a lot of people have been involved in or are on the fringes of like myself. Actually in thinking on about my parents, I must admit that I have often wanted my father to say more, but he is very private and usually seems to keep a lot of his thoughts to himself, now he is totally deaf I find myself really missing that conversation that he can fully participate in. In actual fact life has changed so much in the last few decades that it is getting harder for the older generation to relate to what we experience today because a lot of it is so different. My mum stayed at home and raised 5 children and helped dad on the dairy farm, so she never experienced having to work outside the home to help keep the mortgage paid and food on the table, she worked so hard which I greatly admire but it is still a lot different to my experience. That is what I am finding hardest about not working at the moment, not feeling I am contributing to the household income. You take it for granted when you are earning a wage. But I am very good friends with my mum so I can imagine how difficult it is for you and countless others who can’t bounce thoughts and ideas around with their mums been fully involved. Wonderfully written. Beautiful and sad. Best wishes to you & your family. Thank you, Marti. We take all the best wishes we can get around here. It’s nice to be prodigal with things that can be freely given, is it not? Great writing. Really appreciate it. Reblogged this on Diplomatic Currents. Elegantly written and powerful imagery. You took us upon your memories, and invited us to feel with you during the best and worst of those memories. Burdens shared are not quite so heavy, Guise. Thank you for taking the time to comment. Thank you Savannah. That is a lovely nom de plume, and I appreciate the rationale you give for it on your blog. Incredibly sad, I finish reading the post. No. I knew it would not be uplifting. And how could it be? With our ears growing down, lengthening, rooting themselves into earth. We are doomed not to hear all the beautiful things. Not to remember the details that make up our current lives. Yeah, not very uplifting. Sorry to say I know exactly where you are in this. It always amazing me when someone extends a metaphor I’ve used to show me a meaning I had missed, Elinor. That is my father’s dilemma to a tee, and it is hard to bear, because he does love her, very much. The moments of joy they have together now are so fleeting, and her is so focused on the pain and the loss. Not that I have any right to criticize. He’s the one who is there 24/7. It is just so sad. Yes it is. Thanks for reading. Oh how I love you for loving your mother and seeing HER even beyond the obedient wife she became in serving your father. For me, this post wasn’t about, …you know,… that word that no one wants to say, but about her being set free. Praying for your family. It must be so difficult. Thank you, Jette. In some ways it is about both. Rather like the mural on your blog cover page suggests both freedom and capitivity. I love the whimsy, BTW. I enjoyed your blog so much. Thanks, Crissy. Good luck on your blogging venture; I’ve found holding to a standard of ‘grace not perfection’ there is as important as anywhere else. I have a number of posts that are useful for new bloggers, just search under the blogging tag. This is an exquisite novelette. I am struck by the power of your recollection, how vividly you portray moments long passed in a way that I can experience them now. Alzheimer’s and dementia are excruciating to observe in those we love and create debilitating fear as we contemplate facing them ourselves. Thanks, Vikki. i appreciate the support. And I could use a few magical mandalas in my life. This is such a beautiful, moving story that I can’t think of a comment that can compare. I just had to leave something to thank you for taking the time to write such a lovely personal story. Your mother sounds like an amazing person. She is indeed. I’m glad to have been able to share her with you. Thank you for this, I know someone who will greatly benefit from this post. Thank you for telling me that. I sometimes worry about sharing things my parents would not be happy about being made public; but comments like yours are one of the reasons I do. Thank you. As-salamu alaykum. Did I get that right? Although technology is important; as we continue leading our lives based on our innovative paths and all the hustle and bustle, we sometimes forget the core things, Such as our parents and the fact that they were heroes, In their own way.. Heroes who need to be acknowledged and appreciated everyday. And that’s something you haven’t forgotten! And for that, I thank you, for you have reminded all of us too of this important lesson. Wow. Praying for you and your family. Such love and strength! Thank you. Prayers always appreciated. Reblogged this on Peonies & Cognac. Paula, a beautiful tribute to your parents. Your vivid descriptions of both as well as gorgeous photos of happier days brought them both to life for me, life when they were young but never completely carefree (what to make for dinner, the age old, nagging question)! I lost my mother to Alzheimer’s three years ago and feel no need here to go into the mantra of I know how you are feeling. Instead, as I do when life gives lemons I will focus on the humor to carry me through. Your description of your parents moving the furniture brought to mind a scene that if video taped would no doubt go viral on you tube. My husband sent a way for some contraption to assist in moving terribly heavy items. It was basically a thick strap placed around each “movers” waist as they stood facing each other and went underneath the item (in our case the mammoth machine my husband employed me to help him move.) On the count of three, while bending knees you would lift the item which was promised to now be weightless. Broken promises. I will leave you with that simple vision and skip the audio of me shrieking that my back was going to break. No sliders here. I find for me it is the comedy in life that helps you through the darkness. As my aunt says, “honey if I weren’t laughing, I’d be crying.” I hope you take comfort in the good times with your parents and find a way to get through these hard days. This is a great read and you are a phenomenal woman/ daughter! Thank you for the compliment. The sister I have who lives near is the one who gets the phenomenal award, truly. She lives this day in and day out. My friend suggested this blog to me, as my mother is sadly slipping away down the dementia path. (I really hate to call it Alzheimer just yet.) My mother has always been my best friend. She has really shaped me into who I am. She was so very intelligent, pretty, thin, well dressed. She taught second grade for years with the patience of Jobe. Now she can not remember most things I tell her about events taking place. I don’t try to correct on most things and just move on unless I have to. She seams like taking care of an 8 year old. On her good times though, she can remember all of her early childhood memories and things she has long term memory of. It so saddens me. I am losing her right in front of my very eyes. Good luck to you. God bless. Yes, it’s a very cruel disease. When someone dies, you only have to say “I’m sorry for your loss” once, and this covers the immensity of grief. But the gradual disintegration of a personality – especially in our culture, which so identifies the essence of an individual with their memories, their accomplishments, their character traits – is extremely hard. Right now, though, it is sometimes like peeling away the layers of an onion. I am seeing things now that my mother could not reveal to me when she had all her faculties. There will come a time, sooner than anyone will be ready for, when that door will shut. So I must focus on the moments of joy we have left, and the connection I am able to make with her in the here and now. I hope you can find a way to do this as well. It does help some. Blessings upon you as well. I know it can be very difficult, and I’m sorry to hear you are going through all this. Thank you for sharing. Thank you for stopping by, Melanie. They say they can diagnose Alzheimers more accurately than they did before while a person is still living, but I sometimes wonder, as my mother has a lot of other heart-related health problems; the initial blackout, for example, was probably related to her blood pressure medication or her pacemaker. I’m sorry we are going through it, too, but there are so many of us; like cancer, the disease creates a community of its own, and there is joy and support in that. Thank you. Yes, it is heartbreaking. Fortunately there are uses for broken hearts too. It must be tough to reflect upon and then organize your memories both happy and sad. I understand on a personal level. My wife, who just turned 54, was diagnosed with Alzheimer’s disease at age 51. It has been very tough on all of us. I cannot even begin to imagine how tough that is, James. I hope you have children nearby and all sorts and conditions of support. My mother is particularly fond of her grandchildren, and it helps when they visit. From your blog it looks as though you have at least one – Finn? He’s a corker! The story of your father eating corn is priceless. Travelling back in time and diving into old family albums is a favourite pastime of mine. I know the reason behind must not have been pleasant, but I hope it brought you a least one or two rays of sunshine. Thank you so much for sharing your story and the story you are part of with us, it was an insightful and touching read. It most certainly did. Though I am still looking for one particular picture which I have memories of and haven’t seen in years. I’m pretty sure it is one of the slide boxes. It’s of my mom holding me while she’s stretched out on the couch in their apartment. She’s in a pair of short shorts, and she is ALL LEGS. I am told that is where I get mine, though she’s a good four inches taller than me. Wow, just found this post. I’ve recently started a blog on dealing with my father’s Alzheimers. There are so many of us. Yes, we are legion. It seems you have some professional experience that helps you understand the essential issues, which is a great blessing for your father. Have you found it hard to talk to your siblings about all this? Do they understand why your dad is going into long term care, and do they support that? I do explain all to my siblings, or as much as they want to hear. It can be difficult. Being a middle child, they sometimes think that I am being an alarmist but I have had all of my fears confirmed by professionals so I know that I am accurate. Being in health care helps a great deal but being a family member is a different side of the situation. My siblings are coming along in degrees. I, myself, am still processing as time goes on. I know that my Dad needs to be in a safe environment and that it is for the best that he moves in the coming months. I worry that he will have a fall and end up in hospital which is no place to be, Thanks to you for sharing your experiences. This is beautiful. Thank you for sharing it. It reminds me that we are always their children and they are always our parents, but we are equally each others. In turn, their sorrows and troubles are ours as well and vice versa. God bless! That’s one way to look at it, yes. I appreciate your stopping by. You write wonderfully! I look forward to reading more! Thank you, Alycin. It is good to remember that people in memory care units have people like you to rely on. Reblogged this on MM Gifts and More. I don’t know how brave it is, Brittany – but I appreciate the support. wow!what an amazing story.thank God for such an amazing and encouraging story its just amazing how our parents grow and the many lesson we learn from them and finally beginning depending on us its a blessing.just keep the little light of of hope burning you are not alone. Reblogged this on MyHealthShare Medical Reporter. Beautifully written, Paula!! Reading such stories really moves the heart. I remember crying a lot after watching movie The Notebook. And this story again touched my heart and couldn’t stop thinking about it after reading, just sitting with numb eyes! Reblogged this on Mobile world. You have written in wonderfully. Actually I’m unable to comment…. but, it was simply beautiful and sad at the same moment, Regards to you and your family. May Lord Shower blessings on all of you! You have commented just fine, Vijita; just like the child who prays the alphabet in your blog post. Sincerity is eloquent, is it not? Thanks for stopping by. Yeah it is! Thank you very much! Wow. You have a great writing style. As my grandmother is severely affected by Alzheimer this story about your parents touches me and I find it very brave to publicise something so personal. Thank you, Luise. I don’t know that it is brave, really; I sometimes wonder if it is fair to my parents to do so, but it is the only way I can process what is happening, and it seems to be helpful to others, so I keep at it. 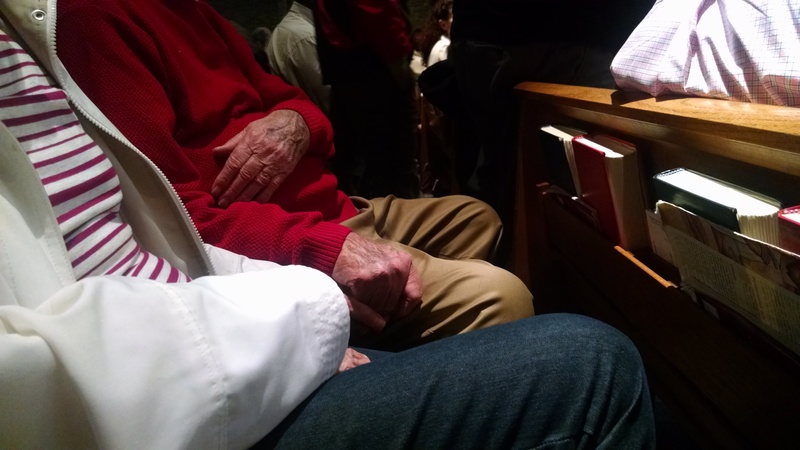 I enjoyed your blog post about township church. My daughter (the one I refer to in my comment on that post) went to Ghana for a semester abroad and had similar experiences. Oh, my dear. They will treasure every single word you write. And it will none of it be boring. I will too. Writing like this is heroic. It shows those of us who read it that terrible times can be lived through, can be made of part of life. I am sitting in a Starbuck’s, about to go visit my elderly mother who can barely see or hear, and who has dementia. Sometimes I’m her sister, but today I am her daughter. I watched my parents age, watched them become dependent on others and said goodbye to my dad three years ago. I completely understand what you are going through with your parents and all I can offer you are my hugs and prayers. It’s a difficult time, but cherish every moment no matter what, love them with all your heart. Thank you, Mary. You are fortunate to live close. Sometimes I can’t decide whether to have an espresso before my phone call or a scotch. But it is all cherished. There are definitely times when the adult refreshment helps, but that is usually on the side of my mom whose daily brandy Manhattan is one of her few remaining pleasures. My grandfather had alzheimer’s disease. It’s a sad thing. But the longer we live, the more common it’s going to be. I’m waiting for the app that will upload my memories each time I lose them. I’ve got a name for it and everything. The AlzZap App(TM). Thanks for the reblog. Yes they are. Incredible, terrible, amazing magic. And yes. Life is like that. I must say your story was plain magical.. i personally found it very sentimental. Reblogged this on Mindless Firefly. One of the best posts I’ve come across throughout my reading frenzy. Beautiful! Thank you. From someone who reads in two languages that is quite a compliment. It helps to put words to an experience, doesn’t it? Thank you for stopping by, and sorry it’s taken me so long to reply. I admire Paul how strong and brave he was to face this part of his life. I wish him more courage and faith no matter what. I love the title of this piece, and am grateful that your post has been “freshly pressed” — or I’d have missed it. My mom was diagnosed with a mix of alzheimers and stroke-related dementias a couple of years ago. She also has other significant health issues, which I guess is not unusual at age 87. And… she is currently in hospital after a fall (no broken bones, but weak legs, and a fair but more fear/distrust about her abilities now). One of my sisters has been mostly estranged from Mom for almost 8 years now — for about as long as Dad has been gone. She has had to distance herself from the rest of the family for her own sanity, for various reasons, and is often seen by Mom and most of my other siblings as a “problem” child. Life with Mom (even as a visitor) is usually unbearable for my sister. The exception is that when Mom is in hospital, my sister is able to spend significant amounts of time with her, and cares for her beautifully. Far better than anyone else in the family is able to. And Mom forgets the conflicts. Forgiveness — in the Biblical sense of any offenses being “not remembered any more” — kicks in. I witnessed this again tonight, when my sister and I ended up visiting Mom at the same time. Mom’s memory often appears to be setting-specific. And she can change from being lucid and engaged to being totally confused in an instant, sometimes. I am really grateful that while she is hospital, at least, my sister is free to visit, and to ease the load. They both benefit, and I do too. I wish you much joy and laughter even in the midst of this uncomfortable, painful journey. May you find even more ways to support your Mom and your sister in this, so that you will be blessed in unexpected ways yourself. The journey itself may not be a good one, but there are going to be lovely waystops as it progresses. May you share many. And may your stories continue. I hope to revisit your blog in future. Oh — and yes — I noticed your mom’s gorgeous long legs! Thank you, Diana. That is such a lovely story about your sister. It doesn’t always work that way with estrangement, but when it does, the gratitude is palpable. And yes. My mom had great legs. Thank you, Himali. I liked your post on the earthquake, too. Thank you so much.. I really like your blog posts..
Wow, Paula, so many congratulations :D so happy for you!!!! Many comments here. A few congratulations over there. I appreciate both. Thanks, Laura. Thank you. I wish it was ancient history, and we had a cure. Not me, m’dear. But I hope to be when it’s my time. Thank you for commenting. Thank you, Kalah. I wish I were as tall as she is, then I wouldn’t look so dowdy in all the dresses she passes on to me…. ;-) Will stop by your blog and say hello, but it might not be until after my grant deadlines are done (that’s the day job). I absolutely loved your post and it touched my heart. I have seen your parents in so many of my patients and I loved them all! Thank you! No, thank you, for loving all those patients… That touches me, too. Reblogged this on It's Me, Ardyey!. Well and honestly written. You have some poet in you, too. Thank you! Thank you. I can tell you have some storyteller in you, too. Enjoyed the post about your own mom. There is a program specifically aimed at older people with memory problems who benefit from telling stories; I went to a workshop on it at the National Storytelling Network conference a few years ago. It’s called Timeslips. http://www.timeslips.org/. The point of that program is that the stories don’t even have to be historical or memory-based; older people can get great benefit and joy from opportunities to use their imagination. Reblogged this on Marinki's Blog. Thank you, Xin Yi – or Cindy, as you prefer. ;-). A little bit of encouragement is always appreciated. This is spam, but it’s such cheeky spam I can’t bear to delete it. I did check out your site. I’m very sorry about the kitten. Here’s a tip if you really want to connect with people on blogs: read their stuff, and make a sincere comment about something that moved or engaged you. I’ll return the favor and check out your blog now! Also, the piece did touch me personally, I lost my grandfather to Alzheimer’s in 2001. So thanks! Beautiful. It’s better to have loved and lost (or forgot), than never to have loved at all. I suppose that’s true. Thank you. Oh, but you’re such a deep, keen, sweet and kind soul to even bring yourself to put such a delicate yet important part of you and your family in writing! Deep, moving, yet so beautifully written! May God give you and your family strength, wisdom, understanding, patience and a lasting sense of acceptance🙏 Bless. Aaawwww! What kind stuff you just did say (read write)! Now tell me dear Paula, how could I possibly hug you across the oceans?! Please accept the warmth of my virtual hug for now. Yes, it’s real! My grandmother had Alzheimers and my uncle as well. She went into a home eventually, but we checked her out for family holidays–my last memory of her, she is singing Christmas carols to herself at the top of her lungs in a comfy chair by the fire. On the other hand, my aunt tended to my uncle herself until the day he died. She stopped letting family come to visit when his condition deteriorated, not even allowing the home health aid see him in any way that might be undignified. My mother is terrified she will eventually develop it as well. She would already be lost without her Post-it notes. I make her take every supplement and follow every diet recommendation studies show might prevent the onset…and try not to worry. Worrying doesn’t help much, does it. And then there’s the worry you have yourself every time you forget something. Is this the start? Is it it? Personally I’m happier with your grandmother’s story than your uncle’s; I understand your aunt wanting to preserve his dignity, but dignity can be very lonely. And if a home health aid can’t see you in a way that might be undignified… well isn’t that what the aid part is for? This is an issue I have with my parents, who don’t want to take any help, but my dad’s eyesight and his mobility and strength at 86 – not to mention his patience and his ‘bedside manner’ – are really not up to what he is attempting. Beautifully written.. Many are ashamed or too scared to talk about this condition…it’s a scary one…..
we purchased a book called “‘Contented Dementia” …I would strongly advise anyone living or caring for someone with this condition to read this book…it totally changes ones outlook and it honestly helps in making life for the person and the carer, so much easier by teaching carer’s just to think differently….it REALLY really does work……it’s my other bible now.. Thank you. I’ve read some good material on habilitative versus ‘reality’ therapy; now if only I could get my dad to read it; or to pay any attention to ‘book learning’ at all on this score. I’ll add this to my reading list. I’ve actually been thinking of doing a post on books that have been helpful to me so far, and will expect people to link in the comments to other good materials when I do, so if you happen to come across that post when it comes out and I have not yet read and listed this, feel free to add it to a comment again. I want to add my thanks to Paula’s. I followed your link, and this book/approach looks really hopeful — I have now put a hold on the one that is in the local library so once the current reader and the next-in-line have read it, my turn will come. My family is so in need of something like this, because with 7 siblings and a mother dealing with a combination of dementias, we are struggling. And, since we are all approaching her with our own ways of dealing with the world, Mom is often overwhelmed. IF — and this is a huge IF — we can agree to try this approach, and it works as well as you say, there is hope ahead for a better life for Mom than we currently see evidence of. So thank you. And Paula, I suspect that when you do get around to the post of books that have been helpful to you, it will be well received. I’m so glad I found your blog. We have to learn to live in their present and by doing a profile……all family and old friends do this together, to gather names that the person often talks about, and build a ‘photo album’ history….carer’s can then understand the persons frame of mind at that minute…it sounds complicated but it really isn’t. I have had people that have gone on SPECAL that have even had their medications reduced to a minimum…. It really does work…just takes patience, understanding and listening. The training facility is in Chipping Norton in the UK and they do training days for family and friends as well as carer’s. Was my pleasure to read this post. Honest and beautiful couple. I must say. God bless! I have worked with people suffering from dementia, at a home for dementia-patients, and this story reminded me of the people I helped there. The job was a bit too hard for me, I didn´t like seeing some of the things I saw – it made me sad. So, I quit. But it was an experience I don´t want to be without, I now know how important it is to take care while you can.. I can certainly relate to that. I don’t know how I would manage in such a setting, but there are some incredibly tender and capable people who do. Some not so, unfortunately, as well. And some well meaning people who just get tired. Thanks for stopping by.